A few weekends I managed to get down down for an Internal Strength workshop at Steve Seymours Sensei’s dojo in Balmain, led by Michael Dreyer Sensei (a student of Bill Gleason Shihan and IS affectionardo). Aikiweb.com in recent times has seen an increased focus on this approach and essence in Aikido, so much so its its own topic now on the bulletin board. Definitions on what is Internal strength, also called Internal power (IS/IP) vary considerably and there has been some lively discourse on this topic. The material presented in the seminar was based on a series of exercises for solo training, to develop a relaxed yet powerful structure, from a seminar with leading practitioner Dan Harden. The idea is that Aiki isn’t just something between uke and nage, but instead is aiki within our own bodies as we become the ‘bridge between heaven and earth (see the excellent Sangenkai blog). The testing of this development, with the aid of a partner, reminded me some what of my days in the Ki Society and at last I can see a little more of the purpose of what Tohei Sensei might have been trying do. 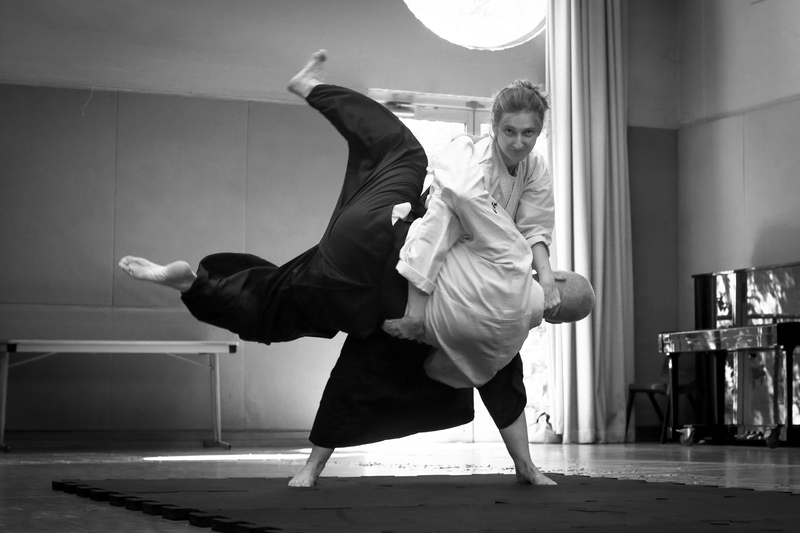 Dreyer’s extension to some of the kata of Aikido really helped ground the work. The body work is hard to articulate but things are starting to gel. Everything they say is a journey and I guess for me it began way back when looking at the physics of unraisable body, unbendable arm (popular exercises among many from my Ki Society days)(see Aikiphysics). While this brought me into some disrepute in certain circles it was a way to get a handle on the skills in terms I could understand. Dial forward a few years and as my professional life got more involved in biomechancis, so to did my curiosity about the biomechanics of aikido. This led to a number of insights about stability, centre of mass and toppling of Uke (Aikiphysics II – biomechanics of throwing), which was the topic of our winter camp 2 yrs ago. This understanding allowed me to, without resisting, not feel or receive some techniques from many, such as nikkyo and changing the dynamic of unbendable arm such that the physical process of applying force to bend my arm no longer existed. While these are parlour tricks by themselves, and not necessarily productive practice per se, they brought a little understanding that allows technique to be applied much more subtely. Trouble was it still doesn’t explain everything. Whats happening inside the body is incredibly complex and joint segments just can’t quite do it justice, particularly when working with people that have done internal arts like Bagua, special thanks Simon and Craig for the opportunity to discover something of these things with you. Sometime back a visit to Okajima Sensei’s dojo to do ‘other budo’ revealed something of the Daito Ryu and hinted at something quite intangible that later became a part of Aikido Yuishinkai, a follow up visits last year where ‘everything is Soutai’ made little sense…until the seminar, as too did some questions about ‘InYo’ which yielded just more questions at the time. Hitting the books Ellis Amdurs ‘Duelling with O’Sensei’ and ‘Hidden in Plain Sight: Tracing the Roots of Ueshiba Morihei’s Power” began doing the rounds and alluding to other training methods (as to his guide for internal strength training ). An opportunity to practice with someone in Melbourne that had attended a seminar on IS by Mike Sigman (another acknowledged IS researcher) gave some more clues as did a book about a contemporary of Ueshiba “Transparent Power A Secret Teaching Revealed’ which was about Yukiyoshi Sagawa” provided further clues. Most recently, last year I had to travel to Boston and had an opportunity to practice with William Gleason Shihan. As a prequel to this one of his seminar DVD’s as well as one on connection by Ledyard (purchased from Aikieast) were helpful in raising more questions. Its baby steps for me now and I’m hopeful that some further progress and training opportunities can be made. Big Thanks to the wider community aikido community, Seymour Sensei’s open approach and right up the IS food chain too! Daniel… happened on your blog while I was internet surfing. One comment I’d make is that “Internal Strength” (a translation of the term “nei jin”) seems to have a number of different approaches, currently, much in the same way that you can go around the world and find some radically different things being called “Aikido”. Most of my interest is through the Chinese martial-arts and specifically the classical approach that is outlined in the old texts about Six Harmonies. Ueshiba was repeating some of the old classics as a method of establishing the credentials of Aikido in the classical sense… a common phenomenon in many martial-arts in Asia. However, it’s not completely clear how “pure” his usage of the classical approach was, so that’s a point to be considered. Some of the other many approaches don’t seem to be concerned with the old Six Harmonies approach, so please use caution when lumping everything together because it’s not all the same and ultimately I think it’s best to be clear for the sake of the newer students, if for nothing else. Thanks for the feedback and info ..its much appreciated! I think its fair to say its just baby steps for us at the moment, after mucking around with biomechanics (which is an isn’t IS I see now) and having read what we could find about IS and practiced reasonably widely (admittedly within the aikido community mostly) the baseline is really just us getting a first hands on experience – rather than getting defining what is and isn’t IS (maybe that comes later for us). Agree that there are as many definitions of IS as Aikido and so with our first steps into a larger world its just a beginning. FWIW very appreciative of your work in spreading the word through your writings on the internet of a long and sustained period of time. There’s been some talk of Dan going down that way, but I think he’s still thinking it over. In the meantime, he comes to Hawaii three times a year – and Hawaii’s always a great place for a vacation! I have a background in Bio-mechanics, educational & career choice, I too try to figure these concepts out from science.